← Rihanna’s hairstyle: what will it be for the AMAs? Hillary Scott, Miranda Lambert together with her fiance Blake Shelton were forces to be reckoned with at the Country Music Awards. Hillary’s Lady Antebellum is the Vocal Group of the year. 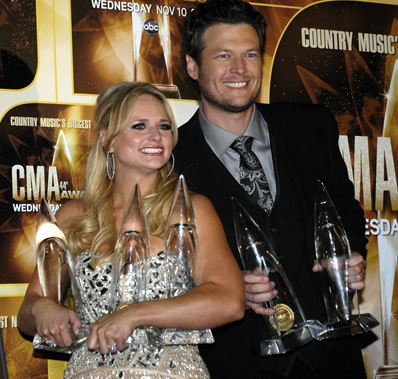 Miranda and Blake are the vocal couple (not an official category) of the year with wins in the top Female and Male Vocalist. 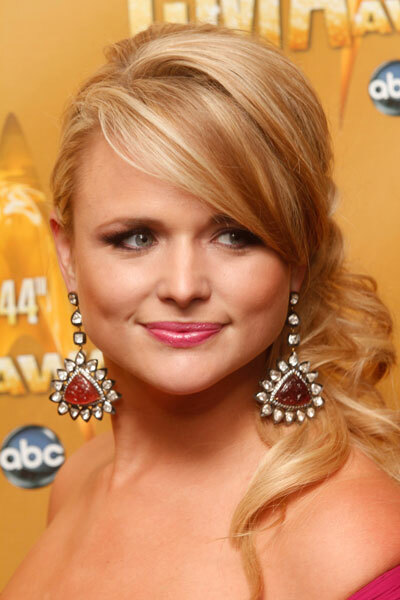 Like many big stars, Miranda took advantage of the night to wear more than one look throughout the night. Her fanciest ‘do was pouffed up and swept to one side. After her Revolution-ary singing, the blonde’s bangs were pushed back and the length freed from her left side. Meanwhile, the lady of Lady Antebellum stuck with her polished curls but the top of hair went up and back on top. To copy it, do a roller set, tease hair around the face, gently comb into place and spray. Watching Gwyneth Paltrow perform was like a preview for Country Strong her soon-to-be-out movie. In the movie she looks the part of a Nashville girl with her long layered waves. For the CMAs, though, she went back to her famous movie star mane. Her hairstyle choice simplified preparation for the premier that was giving her butterflies. To get the super sleek look, blow dry hair over a jumbo brush and follow with a flat iron. In the film Gwyneth’s hair looks more like Carrie’s, smooth curls that require blowdrying plus a time-consuming styling with a curling iron. While the critics dissed Taylor Swift’s dowdy ‘do, we thought she looked as pretty as ever with her full hair twisted and rolled into a French-style coiffure. Laura Bell Bundy, Gretchen Wilson and Jennifer Nettles represent the three major hair groups: short, medium and long. Laura and Gretchen wore pretty similar looks, but the blonde was able to get more volume because her hair’s shorter and more layered. The blonde’s coif requires more time than the others requiring a blowdrier, rollers and possibly a curling iron. To get Gretchen’s coif, dry hair smooth and follow with a curling iron. Hold the iron vertically and alternate the curling direction, taking one strand forward the next back. Sugarland’s Jennifer Nettles has the sweet simplicity that comes with a short cut. Hair that has a good cut and a little body takes little more than mousse or sculpting foam and fingershaping while drying. Julianne Hough surprised fans when she walked the red carpet in a new red haircolor. While her mane has more highlights, it would be just as pretty with more brown to create an awesome auburn that shines during cold-winter months. Steel Magnolia’s Meghan Linsey sticks with the sassy shortcut she’s made her own. Styling is easy but takes a little more effort than Jennifer’s. Most hair types would need help from a blowdrier and round brush to smooth, lift and roll. Katherine Heigl is yet another celeb criticized for her looks at the CMAs. Wouldn’t we all want to look this “bad”? We think it’s cute and know the style works well on many hair lengths. Short ‘dos just need to be curled and lifted off the face. Longer locks can be worn up and smoothed down in back to complement the high crown. Katherine was at the awards with her hubby-country crooner Josh Kelley. Another significant other on the country music scene is Kimberly Williams-Paisley, actress-wife of the Entertainer of the Year Brad Paisley. Retro waves brought a touch of Old Hollywood to the awards show and complemented Kimberly’s glam gown. All this goes to show that there’s more variety in country music hairstyles than there used to be. Here’s hoping it will continue to evolve! This entry was posted in Uncategorized and tagged all kinds of hairstyles, Blake Shelton, Brad Paisley, Carrie Underwood, CMAs, Country Music Awards, Gretchen Wilson, Gwyneth Paltrow, Hillary Scott, Jennifer Nettles, Julianne Hough, Katherine Heigl, Kimberly Williams-Paisley, Lady Antebellum, Laura Bell Bundy, Meghan Linsey, Miranda Lambert, Taylor Swift. Bookmark the permalink.